It’s no secret that overnight oats are the cool breakfast in blog world. I’ve made them once before and it was ok. The banana was a little overpowering and I never made them again. Until now. I just let 1/2cup plain greek yogurt, 1tbsp chia seeds, and 1/3 cup oats hang out together overnight. Then this morning I served the oat mixture atop a bed of strawberries. It was yummy, for sure. But to be quite honest I think I preferred the few scoops I snuck while mixing everything together last night. One minute oats may be my new specialty. –> Does anyone have any overnight oat advice for me? What’s the best way to make them? 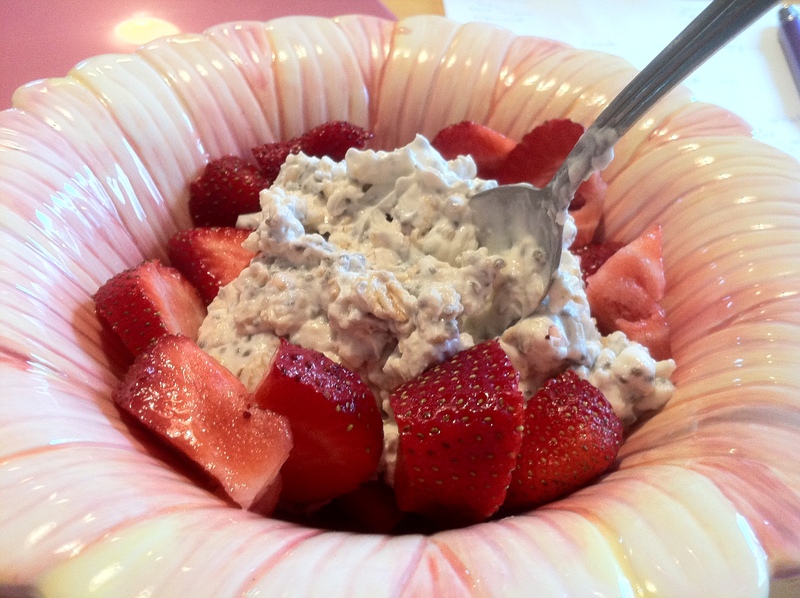 I can’t believe I have yet to try overnight oats! This looks so good! I’m going to make it for breakfast tomorrow. I’ve still never tried ONO. I just don’t think I’d like the cold oats as much as I like ’em hot! I have yet to try overnight outs, but I have made a breakfast cookie which is pretty similar and I’m obsessed with them now! I love how you served it over strawberries — that might be how I need to fix mine! Maybe using vanilla greek yogurt would be good in the overnight oats ? I’ve never made ONO. I wonder if I’d like them as much as my daily bowl of oatmeal. I’ve been having mine with peanut butter for some protein with almond milk. Might have to try this out and if its a success (which why wouldn’t it be?) I’ll have to teach the whole fam!